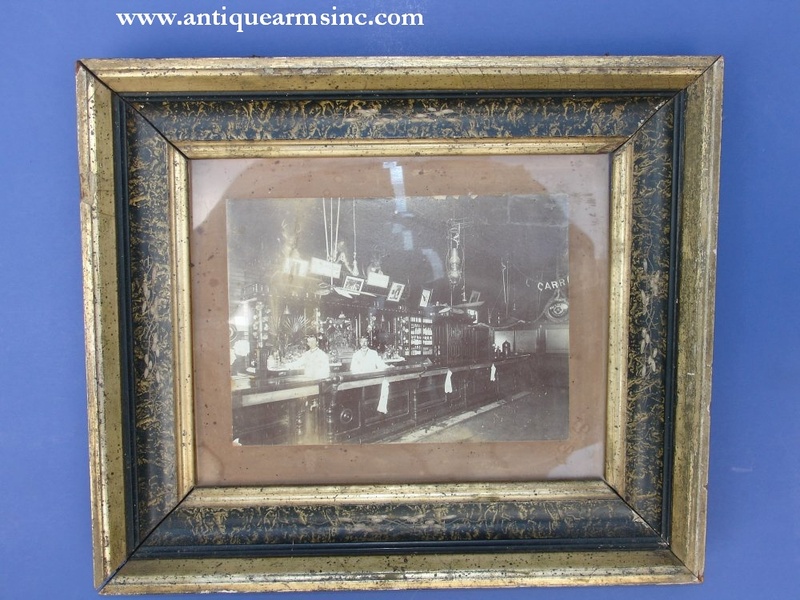 This is just a fantastic large framed photograph from the early 20th century of an old 19th century saloon! Photo measures 8x6"...matteing 10x8" original frame is 14-1/2" x 12". We've had hours of fun studying this one under a glass and discovering the many treasures within this visual time capsule. 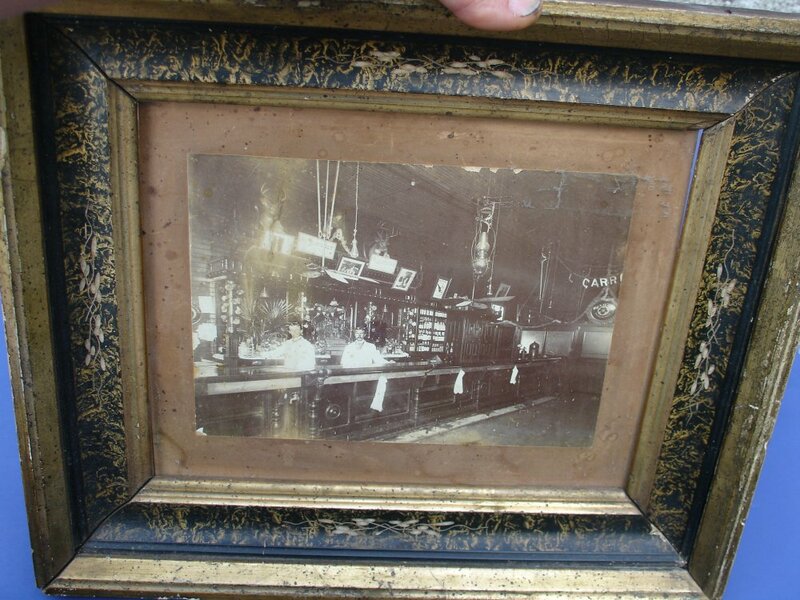 A 120+ year old bar, beer, vintage signs, it doesn't get any better than this! The best part though is that we see the early 20th century transition from kerosene lighting to electricity. 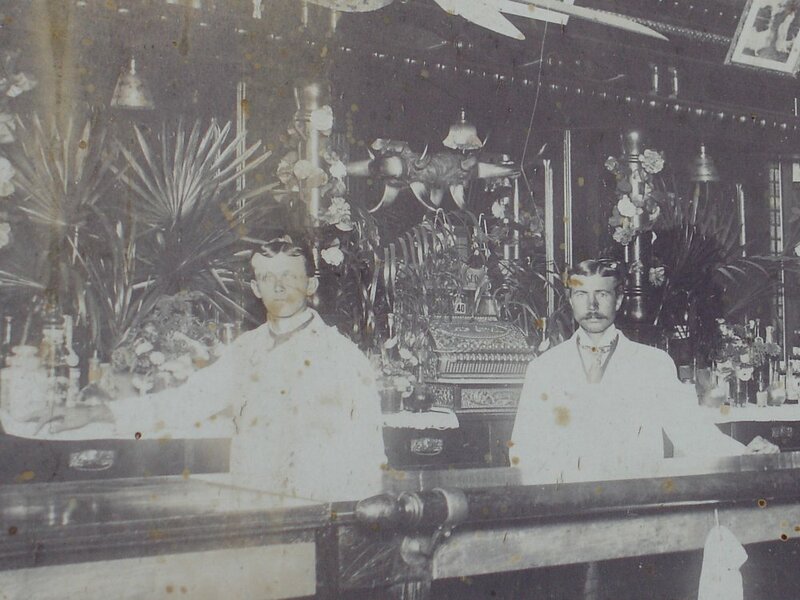 For starters, there are the two young bartenders standing directly behind the counter of the bar. Both are wearing white coats and ties. One even has a slight handle bar mustache. There is a big brass National cash register with a marble top on the wall behind them. 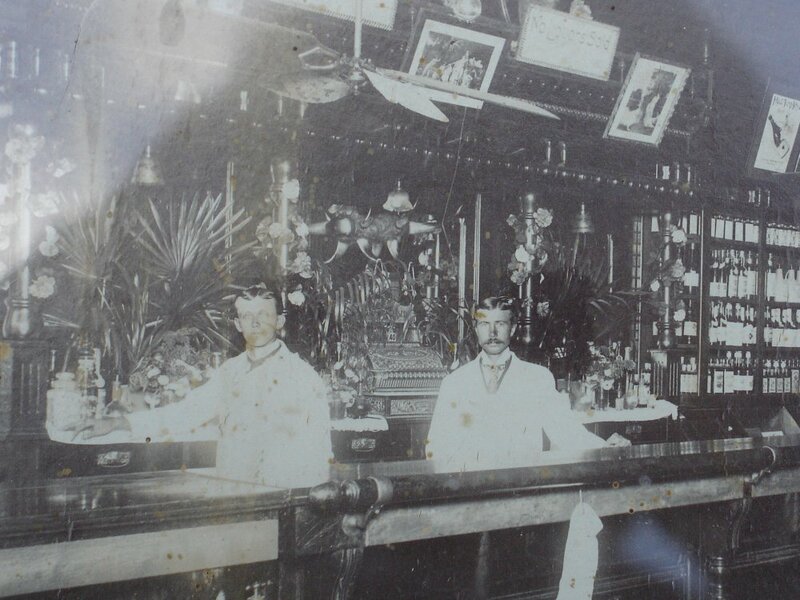 The back wall of the bar is filled with bottles of wine (with labels clear enough to identify on a few) , mirrors on the walls and various adornments including large displays of palmetto leaves. 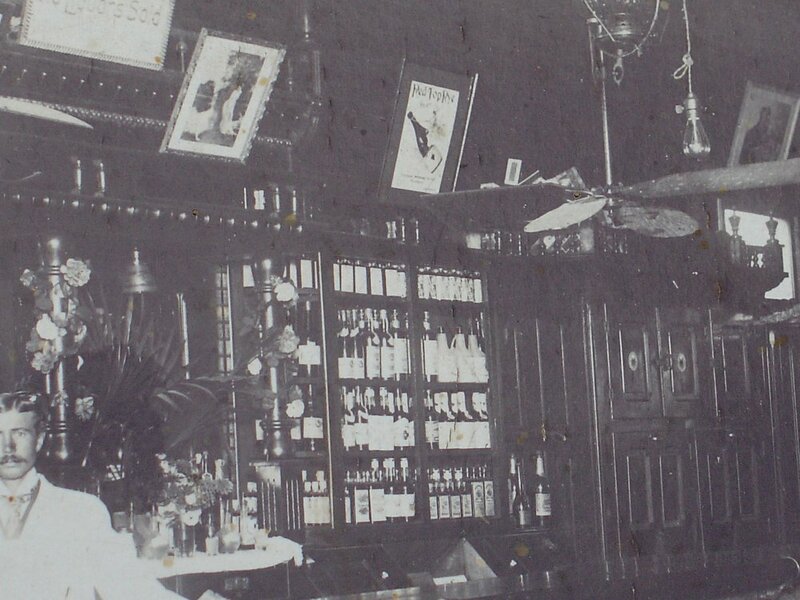 Above them are old pictures and advertisements, deer trophies, as well as two signs which read "No Liquors Sold". 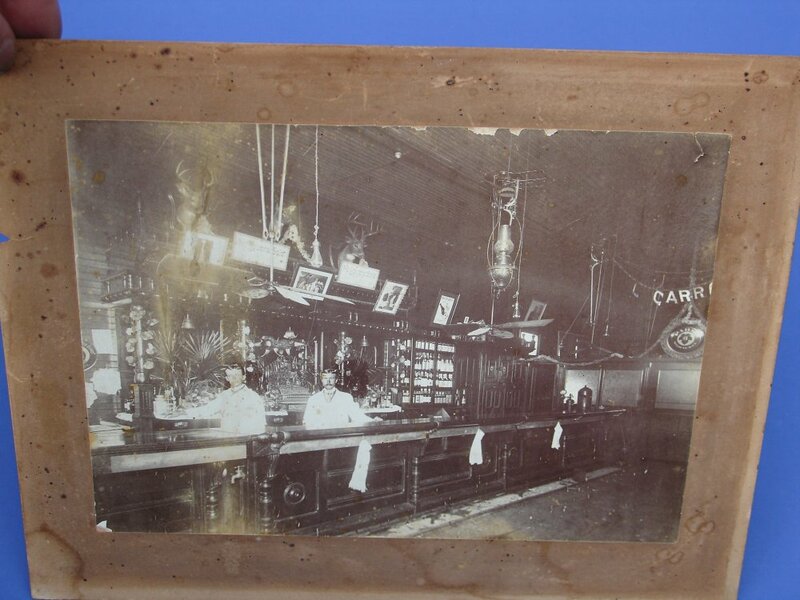 In the back there is an early large round Pabst beer sign with part of another similar sign to the extreme left edge of the photograph. The bar itself has it all...recessed wooden panels with small wooden columns , a foot rail and large brass hand rail along the top with bar towels hanging down. If you look close, there is even a small water spigot off the corner of the bar wall for mopping the floor. Its what's on the ceiling of this bar however that is my favorite part of this photo. There are at least three ceiling fans with long shafts and run up through the roof...belt driven. 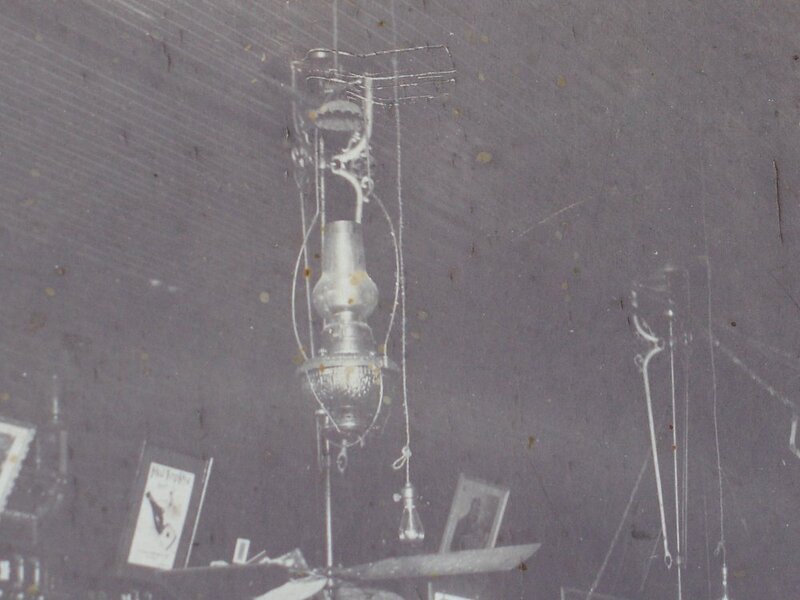 Then there is an old kerosene lantern which looks to have fallen by the wayside to modern electricity as there are what appear to be Edison Mazda Lightbulbs hanging down the length of the bar. The frame is in fair condition...all there but shows its age. Photograph is in Good condition with some fading along the top left and some tiny ripples due to 100 years of different expansion and contraction ratios to the cardboard matte it's mounted on. Back of the pictures reads "Property of J.A. Welch". A great occupational photo from the early 20th century.